Doug and I went over to a co-worker's Alpaca farm this weekend. One of her alpacas just happened to have a baby the week prior so we got to see the cute lil girl. She's completely black and her name is Oprah. Named so because she's black and worth a lot of money. She was saying she could probably get around $25k for her. The females are worth more and the color also has value. I got some cute pics of the baby and the other adults. 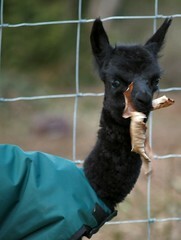 The name of her Alpaca farm is Power Line Alpaca's because there's a big power line that runs right over her property. Here's one of my fav pics. Click on it to see the rest.